One of the most talented actors Liam Hemsworth is a married man. He is married to his longtime girlfriend, Miley Cyrus. They tied the knot on 23rd December 2018. Their wedding ceremony was a private affair, which was not known to the media. It is said that the couple had gone for the vacation and that time they got married. After the wedding, Miley uploaded the pictures of her wedding. They were in an on and off relationship for a decade and now finally the couple took the vows to stay together till death. Before, he was in relation with Laura Griffin from 2006 till 2009. Being an attractive man he was in a relationship with Maika Monroe in 2015 and Eiza González in 2013. 1 Who is Liam Hemsworth? Liam Hemsworth is one of the attractive looking actors in Australian industry. He is known for his roles in some series like Neighbours and The Elephant Princess. He has also been a part of some American movies like The Last Song, The Hunger Games film series and Independence Day: Resurgence. Talking about his early, he was born on January 13, 1990. He experienced half of his childhood in Melbourne, Australia. His parents were Leonie who was an English teacher and Craig Hemsworth who was a social-services counselor. He has two brothers Chris and Luke Hemsworth, who has made a great success in the film industry. Talking about his ancestor they were English, Irish, Scottish, and German. During his childhood days, when he was 8 year, he and his family relocated to Phillip Island. He and his brother Chris moved to the United States of America to uplift their education and as well as their acting skills. At first, they stayed in the guest house of Chris’s manager. Besides this, there is no information about his education history and also about his early life. Liam Hemsworth gave a start to his career in 2007 with guest appearances on the shows named Home and Away and McLeod’s Daughters. Then he got a chance to be a part of Australian soap opera Neighbours. He has also been a part of the children television show The Elephant Princess. He was in the movie Satisfaction and also the British film Triangle. He was selected for one of the biggest movies in Hollywood ‘The Expendables 2 ‘. He was chosen for the superhero movie Thor but he was out of the state, so his brother Chris got the role for the movie. There was an announcement by the Disney that Liam Hemsworth would be the part of The Last Song. He was also featured in Miley Cyrus’s music video ‘When I Look at You’. He was then chosen for Arabian Nights which is a 3D action film. Later in 2010, he hosted the Nickelodeon Australian Kids’ Choice Awards. He starred in a song called “Colder Weather” which was a song by the Zac Brown Band. After his great success in the industry, he was a part of several war dramas called Love and Honor. He reprises to his roles in The Hunger Games: Catching Fire, The Hunger Games: Mockingjay – Part 1, The Hunger Games: Mockingjay – Part 2 which was released in the following years of November 2013, 14 and 15. In summer 2014, he was a part of the Australian literary adaptation called ‘The Dressmaker’. In 2016, he starred in Independence Day: Resurgence which was one of the good movies of Hollywood. 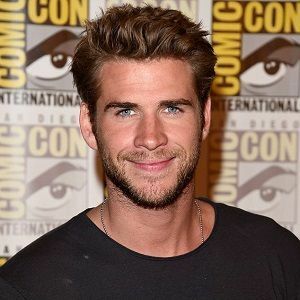 Liam Hemsworth received a good salary but the exact figure is unknown. However, he has a net worth of $16 million dollars. Talking about his rumors and controversy, he and Miley Cyrus were spotted at Soho House in Malibu after enjoying a meal with some friends on Tuesday. In 2013, He was captured making out with Eiza Gonzalez when he split up with Miley Cyrus. There is a trending rumor that he is going to be a dad soon in the upcoming days. Liam height is 6 feet 3 inches in tall and his weight is 75 kg. His waist size is 33inch. He has Brown hair and his eyes are blue. Besides this, there is no information about his body structure completely. One of the popular actor Liam is active in various sorts of social media like Facebook, Instagram, and Twitter. He has more than 7,531,601 followers on Facebook, he has more than 1.73 million Followers on Twitter and he has more than 9.2 million followers on Instagram. Have they split again? Miley Cyrus seen alone at the Grammy Awards function without husband Liam Hemsworth! Are they married? American singer Miley Cyrus spotted with her beau Liam Hemsworth in Georgia! Know about their relationship and Miley’s heart condition ‘tachycardia’!